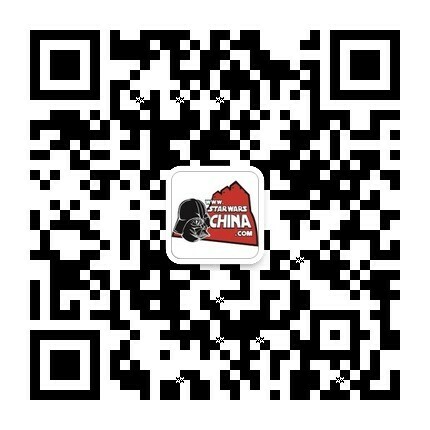 ﻿﻿ 污染者 (Defiler) - Wookieepedia - 星球大战中文网 Star Wars China - Powered by Discuz! "My skills are yours to command." 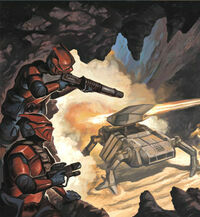 Defilers were elite military soldiers under the command of the Zann Consortium. Though the Zann Consortium possessed a surprisingly well-equipped and organized military force, they generally preferred to use guerrilla warfare tactics or criminal activities to gain influence. The Defiler's main purpose was to spread Tyber Zann's "corruption" throughout the galaxy. Many or all of them were brainwashed to only serve the Consortium. They were essentially the criminal equivalent of the Infiltrators employed by the Rebel Alliance. 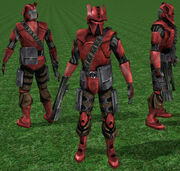 Defilers were made up of many different alien species, trained and conditioned to serve Tyber Zann above all others and concealed under a distinctive uniform of red armor. 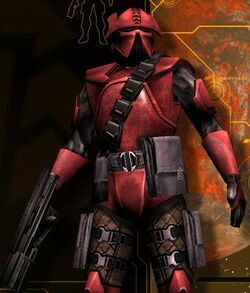 During the Galactic Civil War, Defilers were sent to numerous planets to achieve Zann's goals, often working alongside such infamous individuals as IG-88, Bossk, and Silri. The Defilers were always housed in the Consortium palace, where they would be trained for their tasks. Many defilers served as Zann's most public representatives, as they committed acts of sabotage, kidnapping, bribery, and other illegal activities. They were capable of setting up illegal casinos as part of racketeering operations. When necessary, they also participated in Zann's more covert military actions. Defilers were usually armed with a precise blaster rifle and thermal detonators, and preferred long-range combat. They worked well with the Droideka Mark II in destroying heavier vehicles, and could use their thermal detonators to kill entire squads of infantry. In close combat, they tended to suffer against species such as Wookiees, whose brute strength allowed them to rip off a Defiler's arms. The defilers generally worked in secret because of personal security. When most defilers finished their assignment, they would never appear in the Zann Consortium again, taking no risk on being recognized by any security forces. There were, however, a few exceptions.